Varadkar could be facing an election six month after becoming Taoiseach. 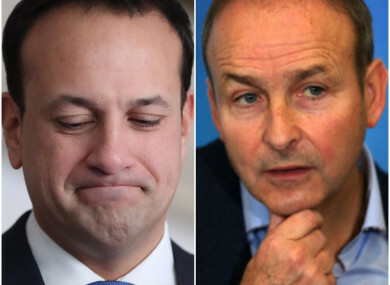 A NEW OPINION poll has put Fine Gael and Fianna Fáil almost neck and neck as the country faces a possible Christmas election. The poll comes amid the continued controversy over an email sent to Tánaiste Frances Fitzgerald concerning garda whistleblower Maurice McCabe. The fallout has led to both Sinn Féin and Fianna Fáil tabling motions of no confidence in Fitzgerald with the Taoiseach and his ministers supporting her. It has led the country to the brink of election with this latest poll being among the most anticipated opinion poll since the February 2016 ballot that returned Fine Gael. The changes in the poll are compared to a previous Red C poll from last month and sees Sinn Féin regain the two percentage points it had lost in that poll and Fianna Fail regaining the one point it had lost. Fine Gael had dropped one point in last month’s poll and this latest poll means that Varadkar’s parties has lost ground in two successive polls. Email “All to play for: Timely opinion poll shows FG dropping and FF catching”. Feedback on “All to play for: Timely opinion poll shows FG dropping and FF catching”.